Solitaire HD by Backflip is quite simply the best iPad solitaire game in the app store. If you love the challenge of this classic card game try this latest compelling rendition. Complete with gorgeous graphics, exciting effects, unlockable content, accruable points and endless gameplay. The makers of popular free casual games like PAPER TOSS and NINJUMP have created a beautiful, high-quality solitaire game that will surely appeal to players of all skill levels. Featuring traditional Klondike play as well as Vegas style scoring, Solitaire by Backflip adds it´s own twist with a plethora of prizes to earn and even the ability to cheat when the deck is against you! 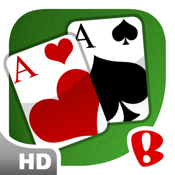 If you´ve been searching for the best designed and most fun solitaire game on your iOS device then the hunt is over. Enjoy responsibly.